I crack myself up. If you read my profile, or know me at all, you already know that about me. But you may not know why I crack myself up. It’s mostly because I do really stupid stuff. Often. Take Tuesday for example. I went to the optometrist for an eye exam. I was expecting the eye test, expecting to be asked repeatedly “Which is clearer?…One?…Or two?…One?…Or two?” (Does this stress anyone else out? It does me.) What I was not expecting was getting my eyes dilated. I had forgotten how blurry those drops make your vision. Driving home wasn’t too bad. Seeing distance wasn’t the problem. I started thinking maybe this wouldn’t be so bad after all. I get home, turn on my computer, open up my tweetdeck, and Voila! A total blur. 10:28 AM – Would somebody tweet my post? I can’t see ANYTHING! 10:29 AM – Now that’s dedication to the twitter. 10:31 AM – How long do your eyes stay dilated after the dops? To which @billycoffey responds: @katdish And I don’t have black “hate” I am a very friendly soul. 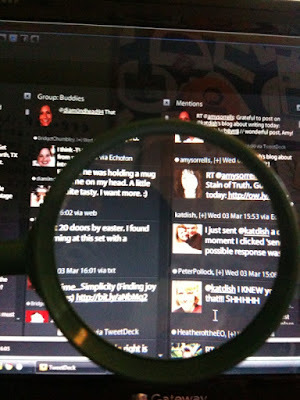 They say confession is good for the soul, so let me confess to you, dear reader, that at this point, I was using a magnifying glass to read the computer screen. But I like being ridiculous, and I love laughing at myself. Because if you can’t laugh at yourself, it’s really hard to laugh with others. There is much to take seriously in this world, and some things are never funny. But taking yourself too seriously? Why would you ever want to do that?